Jeffe--Yes! That's just it: the yummies get me every time. Thanks for the beautiful pictures of multi-colored order. Those pictures make decisiveness look appealing. Thank you, Marian! Your comment here and your Follow Friday link made my day! And yes, it's always good to know we can still tell the stories that don't fit the structure of our books. It's so much easier. This post is fascinating--so many great things to think about here. 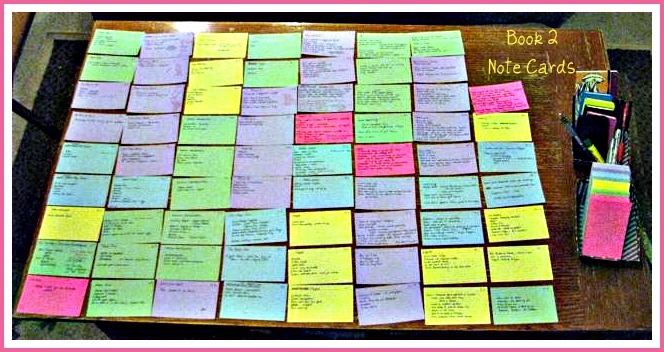 And is it wrong that the picture of the Post-It notes is a highlight for me? ;-) Seriously though, that visual really helps me see how one begins to get a grasp on such a large project. Amy! So good to see your comment on my blog. :D I so need the visual and tactile when I'm reorganizing. Sometimes looking at my cards gives me faith enough to let go. Once I let go, filling in is relatively easy. Again, so good to see you here.